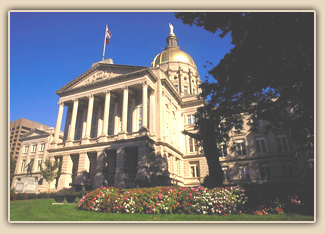 The Georgia State Capitol in Atlanta, GA. The investigation, analysis and restoration of historic finishes at the Georgia State Capitol is one of Welsh Color & Conservation's largest, most complex and most successful endeavors. The building is a National Historic Landmark in the neo-Classical style, designed by the Chicago firm of Edbrooke and Burnham and built between 1884 and 1889. The main entrance on the west façade has a pedimented Corinthian portico. A gilded Renaissance Revival dome crowns the eight-story central Rotunda. Large, arched clerestory windows light three-story atria in the building's north and south wings. WC&CI conducted an extensive examination of all the painted and naturally-finished architectural features in several major areas of the Capitol as part of a comprehensive restoration of the building conducted by the architectural firm Lord, Aeck & Sargent of Atlanta, Georgia. Our participation in the multi-phase project continued over five years, and the scope of the examination included the following spaces: Exterior; First Floor offices and corridors; Atria, Rotunda and entrance lobbies; House of Representatives Chamber; Senate Chamber and the Appropriations Room. The lab analysis included the use of stereo- and polarized light microscopes, micro-FTIR and a spectrophotometer for color evaluation. The rich colours of the fresco [oil paint on plaster] give the room an appearance of magnificence. The walls are painted a dull red in keeping with the cherry [wood] finish and the pilasters are a darker shade. The frieze and capitals are in colors varying from a rich dark red to gilt old gold and buff with a delicate tracery of antique blue. Above the cornice is another tracery of delicate blue figures and above that the cove of the roof is a mass of gilt stars and spangles. The flat ceiling is broken into panels by heavy girders. The panels are antique blue ornamented with silver figures and the girders are painted in rich, darker colors. 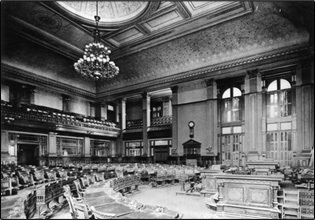 Such historic documentation and a detailed historic photograph of the House Chamber aided in determining the locations of the stencils. The decorative work and color palettes in the legislative chambers were extensive, incorporating 48 colors and 19 distinct stencil patterns in the House and 25 colors in 20 stencils in the Senate. 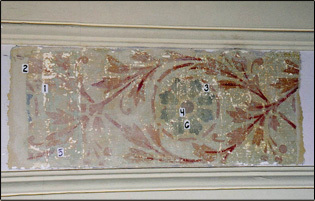 Using solvents, we removed subsequent paint layers and exposed a complete repeat of each original pattern. We took paint samples from these exposure windows for color evaluation and made tracings of the stencil patterns, from which drawings and new stencils were created. Historic photo of House of Representatives Chamber, ca. 1895. This photo was invaluable in determining the placement and nature of the original stenciled decoration throughout the chamber. 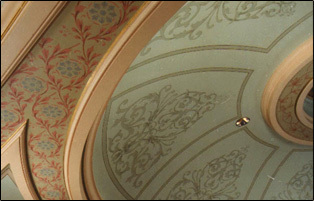 The public spaces in the Capitol originally had a simple and elegant decorative scheme. The original four-color palette consisted of a pale orange yellow, a light green, a dark gray accent on the column bases and an orange shellac on all of the naturally finished oak wood trim. The careful placement of these colors subtly emphasized the classical interior details of the voluminous Atria and Rotunda. Repainting of the Atria and Rotunda with the original color scheme complements the original gray and white marble floor, pink marble wainscot and warm-toned, naturally finished, oak woodwork. The original exterior color palette at the Capitol is dominated by the light yellowish gray of the Indiana limestone masonry. The metal cornice and ceiling and the cast iron stairs at the entrances were painted a light yellowish gray to match. As suggested by the 1889 specifications, the mahogany window sashes received a clear varnish finish, as did the oak entrance door transoms, frames and the original doors. The pine window trim was painted a grayish yellowish brown. The yellowish gray clerestory window trim blended with the limestone masonry. Following each stage of investigation and analysis, WC&CI remained involved in the project to consult in several important capacities. We participated in the preparation of painting specifications and initiated, reviewed and approved all color matches formulated by the selected paint manufacturer. 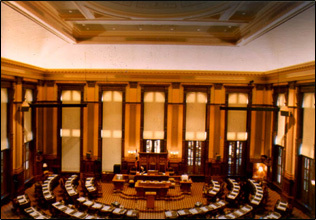 As the decorative painting was being restored in the legislative chambers, we monitored color placement and the quality of decorative painting technique to ensure accurate and consistent results. Please contact us if you would like to receive printed Project Profile information with additional color photographs of our work at the Georgia State Capitol for reference or use in a proposal.